Piper PA46 Meridian ZK-OLY at Auckland on 24 May 2013 before it was exported. After getting OLY I saw Vincent Aviation's latest Jetstream ZK-VAI arrive so I waited to get it on departure. 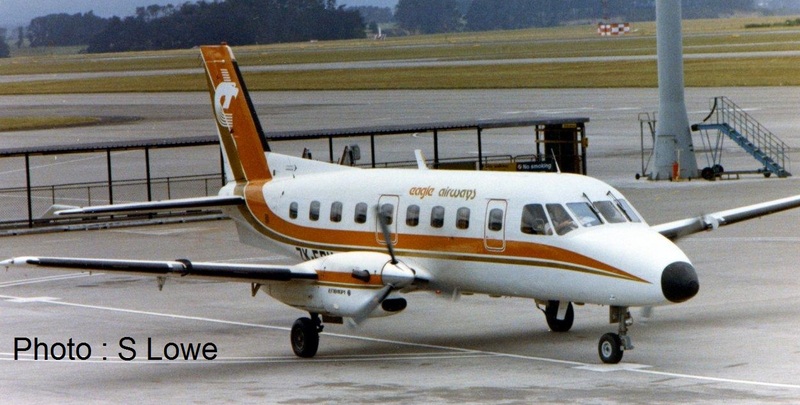 By mid-1979 Eagle Airways were operating Piper Chieftain ZK-EIE and Beech Baron ZK-ECA on scheduled services from Hamilton to Palmerston North, Wanganui and New Plymouth with non-scheduled stops at Taumarunui on the flights between Hamilton and New Plymouth if traffic was offering. Piper Pa39-160 Twin Commanche C/R ZK-ERH was also used as a backup aircraft. 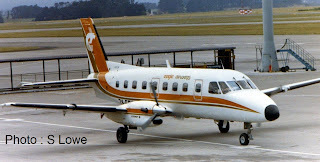 On the 28th of June 1979 Eagle applied to the Air Services Licensing Authority to add one Embraer EMB110-P1 Bandeirante to its fleet and to operate it on between Hamilton and Auckland and Auckland and Whakatane. Eagle’s proposal was that the Bandeirante would leave Hamilton, Monday to Saturday, at 7.30 am to arrive in Auckland at 8.00 am and Whakatane at 9.05 am. The return service would leave Whakatane at 9.20 am to arrive at Auckland 10.10 am and Hamilton at 11.00 am. In the afternoon a Sunday to Friday afternoon service was proposed which would leave Hamilton at 4.30 pm to arrive in Auckland at 5.00 pm and Whakatane at 6.05 pm. The return service would leave Whakatane at 6.20 am to arrive at Auckland 7.10 pm and Hamilton at 8.00 pm. 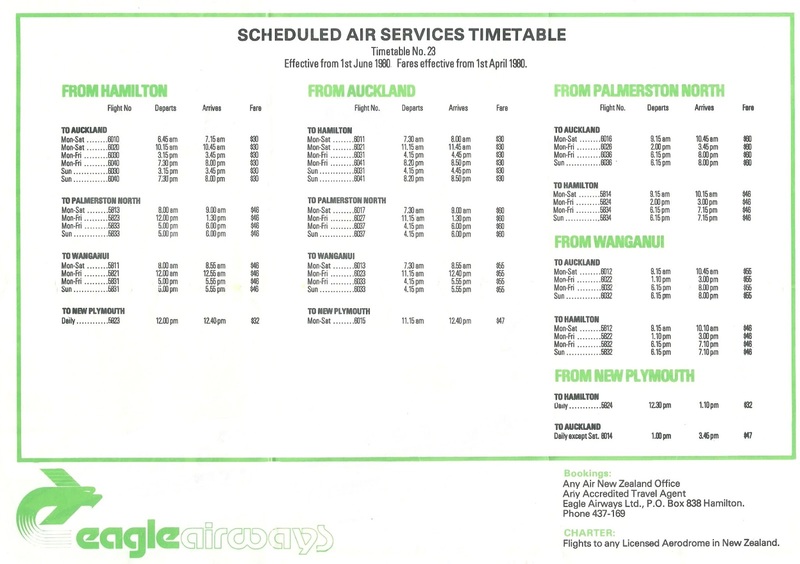 At that time Air New Zealand operated a midday service between Auckland and Whakatane and a mid-morning service from Auckland to Hamilton with the return service being flown in the early afternoon. By this stage the company was getting a 70% load factor on the Hamilton-Wanganui-Palmerston North-Hamilton route with the 9-seat Chieftain and a 46% load factor on the New-Plymouth-Hamilton service, though on the latter the smaller Baron was often used improving the load factor. The company expected the Bandeirante would break even with only 9 revenue seats, that is, with a 50% load factor. The Air Services Licensing Authority approved the addition of an Embraer Bandeirante to Eagle’s fleet on the 20th of September 1979 but the at the stage the application to operate the Bandeirante to Auckland and Whakatane was still pending. Meanwhile the company had again applied to operate a non-scheduled route service Wanganui and Paraparaumu. This second application was again refused on the 1st of October 1979. On the 8th of November 1979 the company withdrew its application to fly between Auckland and Whakatane after Bell Air were granted approval to operate their non-scheduled service on this route as a scheduled service. 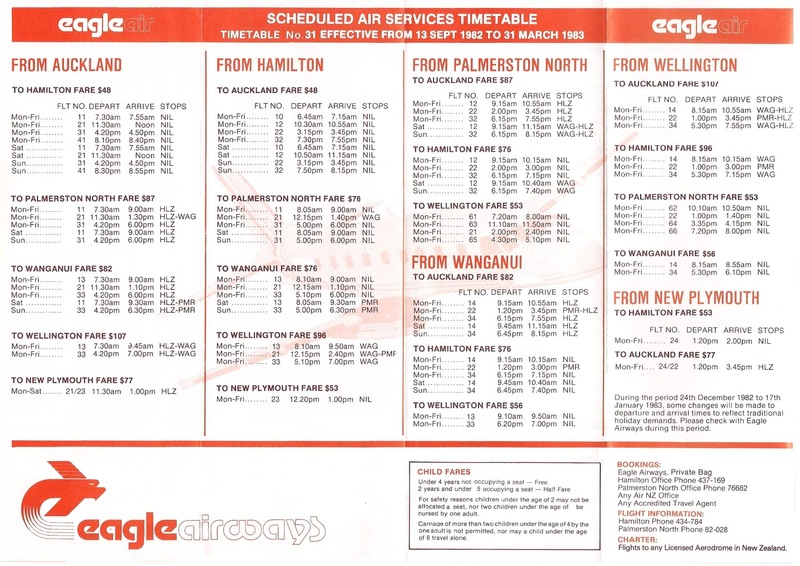 Instead Eagle changed its plans for the Bandeirante and instead looked to operate it on the existing services with from Hamilton to Palmerston North and to connect these flights with new scheduled services between Hamilton and Auckland. Approval to operate the Auckland-Hamilton route was granted on the 12th of December 1979. In early 1980, in the face of a very regulated airline industry that was dominated by the national carrier, the company looked to coordinate its services with Napier-based Air Central and Nelson-based James Air. The plan was that all three operators would operate as contractors under the name Air United. This name was to be used for advertising and for coordinated timetabling. The three companies saw this as an opportunity to rationalise services and to make more efficient use of their aircraft, administration and maintenance resources. The thought was that the combined operations would be centred on Palmerston North which was serviced by all three airlines. In the end nothing came of the proposal. Eagle Airways received its first turbo prop on the 31st of May 1980, just over 10 years after the company’s inception and less than 5 years after air services had started. Brazilian-registered Embraer EMB-110P1 Bandeirante PT-SBF (c/n 110267) arrived in New Zealand after a ferry flight from Embraer's home at Sao Jose dos Campos in Brazil. The ferry flight tracked via Belem, near the mouth of the Amazon, to St Croix in the West Indies, and then via Florida, Texas, Monterey in California, Honolulu and Pago Pago to Auckland. The aircraft was flown by Airwork NZ's Auckland manager and chief pilot, Lew Day, and Eagle Air's chief pilot, Paul Wright. The Brazilian-built turbo prop ushered in a new chapter in New Zealand aviation history and its arrival marked the beginning of modern commuter airlines in this country. It seems quite apt that the name Bandeirante means “pioneer.” Bandeirantes was the name given to Portuguese settlers and pioneers who expanded and moved their sphere of influence and control from the early coastal settlements of Brazil towards the inner and then unknown and uncharted zones of Amazon. Eagle certainly was pioneering a new generation of air services in New Zealand, bravely investing some $1.2 million in the new aircraft and the associated set up costs. The Bandeirante, which was registered in New Zealand as ZK-ERU, was immediately put to work on crew-training as well as being demonstrated around the country. While the Bandeirante had a maximum capacity of 21 passengers Eagle operated it in a 2-pilot, 18-passenger configuration with three-abreast seating. It had leather upholstery, full air-conditioning, indirect lighting and an enclosed toilet. The Bandeirante cruised at 430 kph and was New Zealand's first purpose-built commuter airliner and the most advanced commuter aircraft in country at the time. The Bandeirante entered service on the 16th of June 1980. Its weekday schedule started with an early 6.45 am departure from Hamilton to Auckland. The plane would then fly a Auckland-Hamilton-Palmerston North and return service, leaving Auckland southbound at 7.30 am and leaving Palmerston North northbound at 9.15 am. Connections were made at Hamilton to and from Wanganui, with the Wanganui service being operated by either the Chieftain or Baron. At 11.15 am the Bandeirante would head south again this time flying Auckland-Hamilton-Wanganui-Palmerston North before returning Palmerston-North-Hamilton-Auckland. Connections were made at Hamilton to the New Plymouth service which was again operated by either the Chieftain or Baron. A repeat of the morning services was made in the late afternoon. The Bandeirante departed Auckland at 4.15 pm, to reach Palmerston North by 6.00 pm with the return flight arriving in Auckland at 8.00 pm. Again, connections to and from Wanganui were made at Hamilton. The Bandeirante then positioned back to Hamilton for overnight maintenance after a very busy day. These flights operated Monday to Friday with a single Saturday morning and Sunday afternoon/evening service. 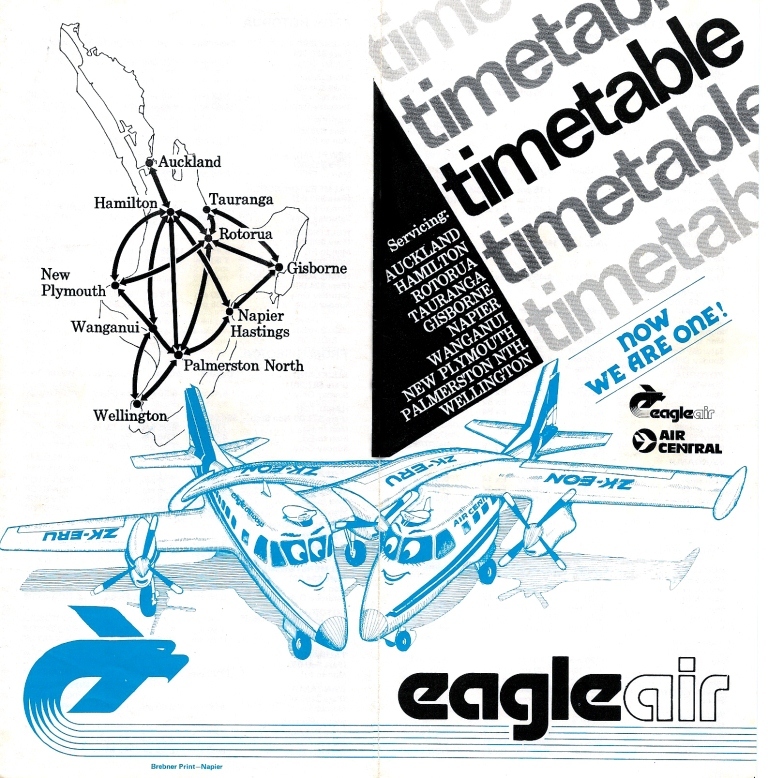 At the time of the launch of the Bandeirante service Eagle was in direct competition with Air New Zealand on the Auckland-Hamilton-Palmerston North sectors. Air New Zealand's services on these sectors were not financially viable. Between Hamilton and Palmerston North Air New Zealand’s service had an average of eight passengers a trip and loses of $636,000 a year, while between Auckland and Hamilton an average of 3.2 passengers were carried with an annual loss of $625,000 a year. The national carrier subsequently applied to relinquish its Auckland-Hamilton-Palmerston North-Wellington Fokker Friendship service. 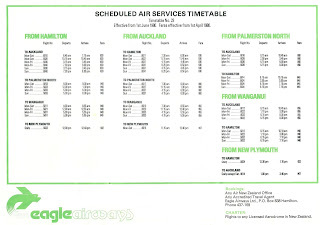 Air New Zealand’s cancellations of these services from the of October 1980 only improved Eagle’s economics. My first flight on a Bandeirante was on ZK-ERU on 24 November 1982 from Auckland to Hamilton. The above photo is taken at Auckland and the one below after my arrival at Hamilton. In the year to the 31st of March 1980 Air New Zealand carried 46,865 passengers between Wellington and Palmerston North with an average load factor on the route of 55.8 per cent leading to a loss on the route of $679,900. 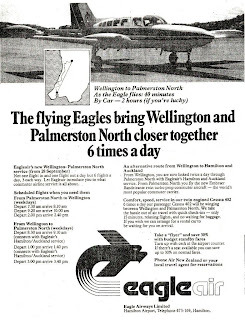 By early 1981 the national carrier had scaled down its Palmerston North-Wellington services and Eagle saw the lack of an early morning service from Palmerston North to the capital and early evening return service as an opportunity to expand its operations. 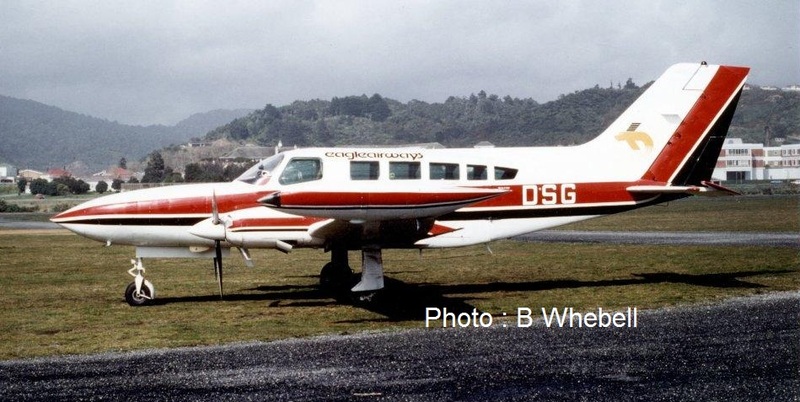 Eagle’s capital connection began on the 28th of September 1981 using Cessna 402B ZK-DSG which provided three return flights daily, Monday to Friday, between the two southern North Island cities. Within two weeks, however, the new air link was struggling. 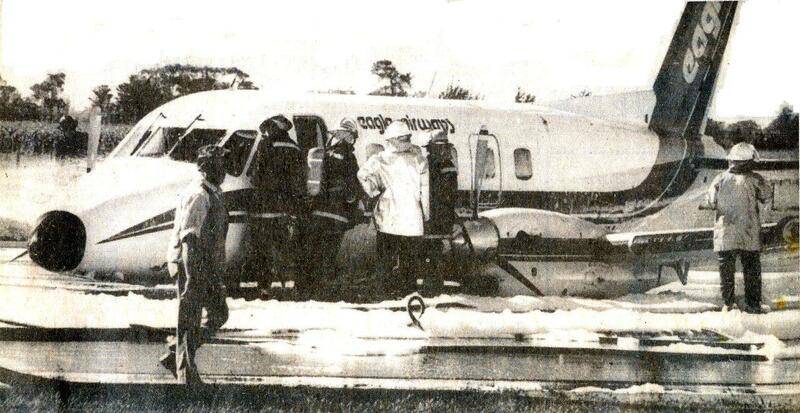 Eagle co-director Mr John Fairclough told the Evening Post that “some flights on the run had been cancelled because there had been no passengers at all. On some of the trips we have taken only one person. It has gone as high as five. We're losing about $700 a day and as a private company we can't afford losses like that. We'll have operated two weeks at the end of this week. Multiply that by $700 a day." In November Eagle responded to the poor loadings by changing its Wellington-Palmerston North timetable to offer a better timetable for business people. The following year saw the addition of another service to Wellington, this time from Wanganui. These Monday to Friday services started on the 13th of September 1982 using the Palmerston North-based aircraft. This aircraft flew from Palmerston North to Wellington before doing a Wellington to Wanganui and return service and returning to Palmerston North. The plane then did two return flights from Palmerston North to Wellington before a late afternoon/evening Palmerston North-Wellington-Wanganui-Wellington-Palmerston North service was operated. In the early 1980s two additional twins were added to the fleet. Piper PA34-200 Seneca ZK-DCI (c/n 34-7350317) was registered to Malcolm Campbell and John Fairclough in July 1981. It was mainly used for multi-engine IFR training for the Flying Academy but it was also, at times, used on scheduled services. In March 1983 a second Baron was added to the fleet. Beech C55 Baron ZK-UPB (c/n TE-29) replaced Cessna 402 ZK-DSG which was by this time being used by Air Albatross. Piper Seneca ZK-DCI at Hamilton on my 21st birthday, the 3rd of August 1983. I was flying Whakatane-Hamilton-Westport-Hokitika on Bell Air's Beech 99. Eagle's second Beech Baron ZK-UPB never carried titles. It is seen at Palmerston North on an Eagle service on 22 August 1983. 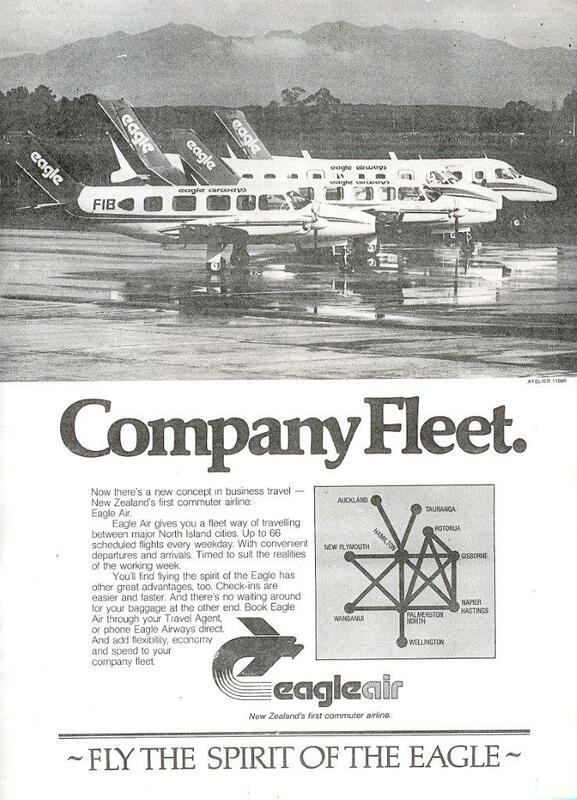 In June 1983 it was announced that Eagle had been sold to the NZI Finance. The year before NZI Finance had bought Napier-based Air Central and NZI Finance saw the purchase of Eagle Airways as an opportunity to strengthen the marketing and operational capabilities of each airline. Initially the two companies carried on operating as two separate entities until they were merged on the 3rd of October 1983 as Eagle Air Ltd under the “Now We are One” slogan. At about the same time Eagle developed an automated reservation system linked into the Air New Zealand booking network which enhanced its status as a major commuter airline. The combined network covered ten cities throughout the North Island from Auckland to Wellington and including Hamilton, Tauranga, Rotorua, Gisborne, Napier, Palmerston North, Wanganui and New Plymouth. With the merger the Air Central name disappeared and Eagle Air inherited Air Central’s three AiResearch TPE Turbo-prop powered Mitsubishi MU-2s, ZK-EKZ, ZK-EON, and ZK-ESM and Cessna 402B ZK-EHS (c/n 402B0217). The route structure remained much the same with the exception of Air Central’s Palmerston North-Rotorua-Tauranga service which was dropped. Malcolm Campbell remained as managing while Air Central’s managing director, John Gardiner, became Eagles’ marketing manager. Inherited from Air Central was Cessna 402B ZK-EHS taken here at Palmerston North on 18 May 1984. The Mitsubishis were expensive to operate and Eagle used them as little as possible and instead the company looked to re-equip. 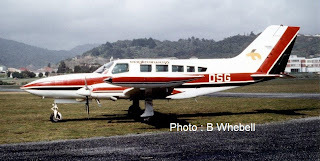 In late March 1984, in a move to standardise its fleet and improve services, Eagle Air sourced a second Bandeirante ZK-FHX (c/n 110225) in Fiji and three more Piper Chieftains, ZK-FIA (c/n 31-7752032), ZK-FIB (c/n 31-7405407) and ZK-FIC (c/n 31-7405450). The fleet expansion cost the airline some $4.5 million. The three Piper Navajo Chieftains were fer­ried across the Pacific from the US in formation. The Mitsubishis were sold in Australia and departed New Zealand in early April 1984. This gave Eagle a fleet of two Bandeirante, five Piper Chieftains including leased ZK-EVD, a Cessna 402 and two Beech Barons. The leased Chieftain, the Cessna 402 and the Beech Baron ZK-UPB were withdrawn from the fleet shortly after. With the introduction of the new aircraft Eagle introduced its first standardised fleet colour scheme which was worn by both Bandeirantes and Eagle’s four Chieftains. In the new colour scheme... Above, Piper Chieftain ZK-EIE still carrying the old Eagle logo on its door at Palmerston North on 18 May 1984... EIE was the only aircraft in the new colour scheme that carried the old logo while below is Piper Pa31 Chieftain ZK-FIA at Palmerston North on 24 February 1985. The arrival of the new aircraft led to Eagle’s services being rationalised. The new timetable effective from the 2nd of April 1984 was particularly geared to the needs of the business community and included a number of morning and evening flights to allow a full day for business meetings. Flights were centred on Hamilton and Palmerston North and were operated on what Eagle called a "wheel and spoke" basis. This saw Bandeirantes operating Eagle’s main trunk routes, namely Auckland-Hamilton-Palmerston North and Hamilton-Napier-Gisborne with the Chieftains and Barons offering connecting services from Hamilton and Palmerston North to other centres. This timetable saw the next phase of the withdrawal of the old Air Central network. Rotorua lost its direct connection to New Plymouth and received instead two flights each weekday, one to and from Gisborne and Napier and the other to Palmerston North. 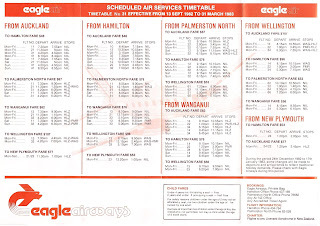 Tauranga’s flights were changed to two flights a day to Hamilton from where connections were made to Gisborne, Napier, New Plymouth, Wanganui and Palmerston North. Flights to New Plymouth were extended with four flights each weekday being operated between New Plymouth and Hamilton where connections were made to Auckland, Tauranga, Gisborne and Napier. New Plymouth also had two flights each weekday to Palmerston North where connections could be made to Wellington, Rotorua, and Gisborne. At the same time direct flights between Wellington and Wanganui were axed because of lack of demand. Over the next 18 months minor variations were made to the timetable. 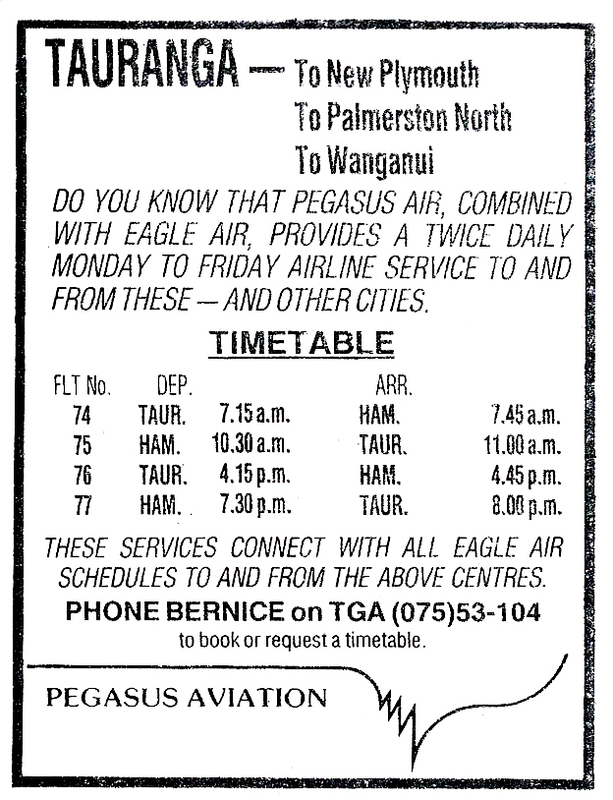 From mid-1984 Tauranga-based Pegasus Aviation was chartered to operate the Tauranga-Hamilton service for Eagle. This gave Tauranga passengers a much improved connection to the wider Eagle network without Eagle having to base an aircraft in Tauranga. From the 11th of February 1985 the Rotorua service was replaced by a twice daily service to Hamilton from where connections were made to New Plymouth, Wanganui, Palmerston North, Gisborne and Napier. Bandeirante services to Gisborne and Napier were also rationalised. 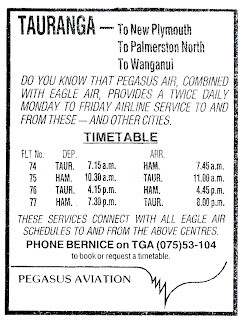 On the 29th of October 1985 the Rotorua and Tauranga services were reduced to a single weekday service to Hamilton, with the Tauranga service again being operated by Eagle instead of Pegasus Aviation. 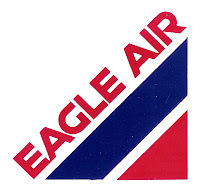 Eagle’s next major expansion took place in December 1985 following the collapse of Air Albatross. Initially Eagle offered a daily Bandeirante flight between Nelson and Palmerston North with the first service being flown on the 27th of December 1985. From the 24th of January 1986, in response to good forward bookings, Eagle increased these daily flights from one Bandeirante flight to three Chieftain flights with morning departures and evening returns, allowing a full day’s business in either Nelson or Palmerston North. On the 1st of April 1986 NZI Financial Corporation sold Eagle to the Mutual Group of companies, though the sale was subject to regulatory approval. The Mutual Group owned, among other things, the New Zealand operation of Avis Rental Cars. The sale was confirmed in mid-May. The beginning of April 1986 also saw changes to the company’s services. The Nelson service was upgraded to a thrice daily Bandeirante service and the Auckland-Hamilton-Palmerston North-Nelson service became Eagle’s trunk route with flights between Hamilton and Gisborne and Napier being operated by Chieftains. At the same time Wellington and Tauranga were both withdrawn from the network. The routes operated by Chieftains were consolidated with up to three flights a day being operated on these sectors. Eagle’s main problem, however, continued to be that it operated on routes between provincial centres. The only direct service it had to Auckland was from Hamilton. This meant it was forever trying to run an economic service on largely lean routes. From the 6th of October 1986, however, Eagle introduced a Monday to Friday direct Auckland-Palmerston North Bandeirante service. 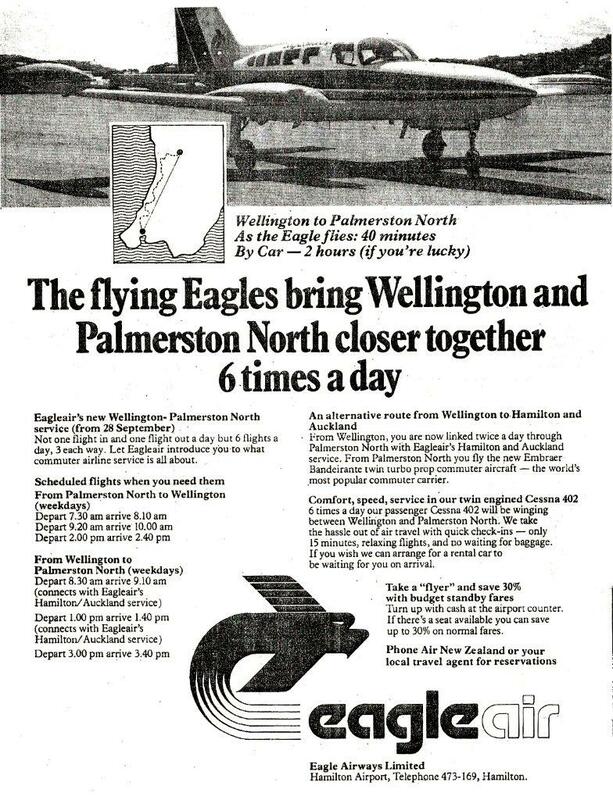 This was the first time Eagle had gone head to head with Air New Zealand since the introduction of the Bandeirante in 1980 and the new service from Auckland to Palmerston North was in addition to the Bandeirante flights from Auckland to Palmerston North via Hamilton. Also from the 6th of October Chieftains replaced the Bandeirantes again on the Nelson-Palmerston North route. By now Eagle was well established as a solid operator though it hit the headlines in a dramatic manner on the 13th of April 1987 when Bandeirante ZK-FHX made a wheels-up landing at Palmerston North. The Bandeirante, with 13 people aboard, was on a scheduled flight from Hamilton. On its final approach to Palmerston North the duty air traffic controller noticed the aeroplane's port wheel was missing. The pilot, Captain Craig Mossman, was reported as saying that he had not realised anything was wrong and was ready to land the plane. "All indications from the cockpit showed everything was O.K. The undercarriage lights were all green showing the undercarriage was down and locked." The aircraft circled the airport for 40 minutes to burn fuel and allowing emergency services time to prepare before Craig Mossman and co-pilot Lance Slight carried out a perfect landing. No injuries were sustained by the crew or their 11 passengers. A further re-equipment programme occurred in June 1987. A third Bandeirante, ZK-KIP (c/n 110286), was purchased and its arrival heralded the introduction of a new colour scheme, the orange and brown being replaced by a largely white aircraft with a simple red, white and blue logo on the tail. The arrival of the new Bandeirante enabled three Piper Chieftains to be sold. Only one was kept, ZK-EIE, and this was used to maintain the Hamilton-New Plymouth sector. 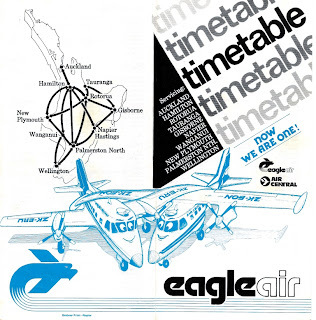 At this time Eagle cut its service to Rotorua as well as the Hamilton-Wanganui service with the last flight being operated to Wanganui on the 3rd of July 1987. This service was later picked up by Air River City. 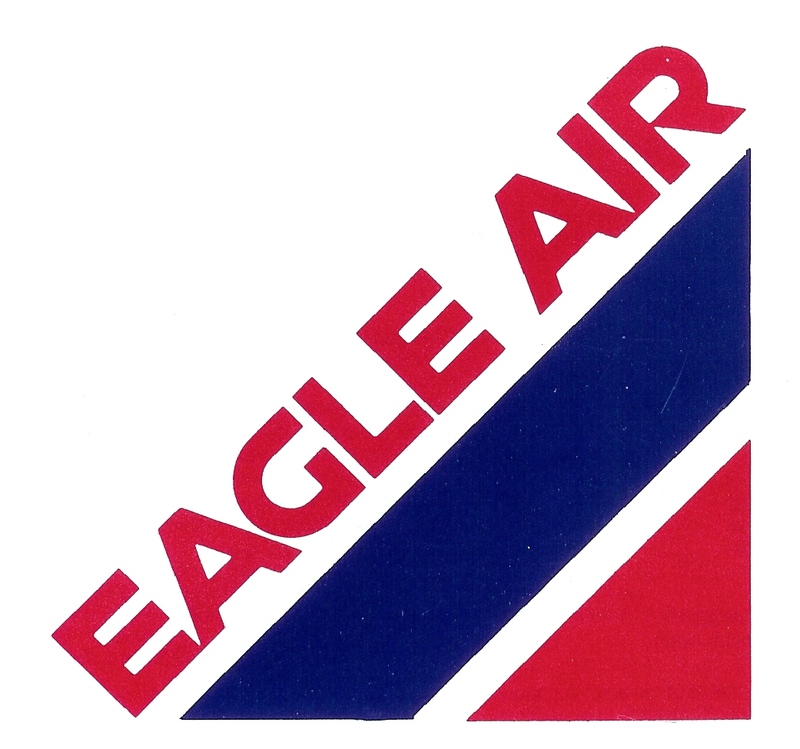 In mid-July 1988 it was announced that Eagle Air and Nelson-based Air Nelson had joined forces with the intention of linking their regional services. Air Nelson and its sister company Motueka Air Services planned to merge from the 1st of August 1988. These two compnaies operated services between Wellington and Nelson and Wellington and Motueka with the intention to introduce a Nelson-Westport-Greymouth service from November 1988. As part of the cooperation between Eagle Air and Air Nelson, Eagle’s Nelson-Palmerston North service was handed over to Air Nelson with Air Nelson also planning to operate a Wellington-Palmerston North service. 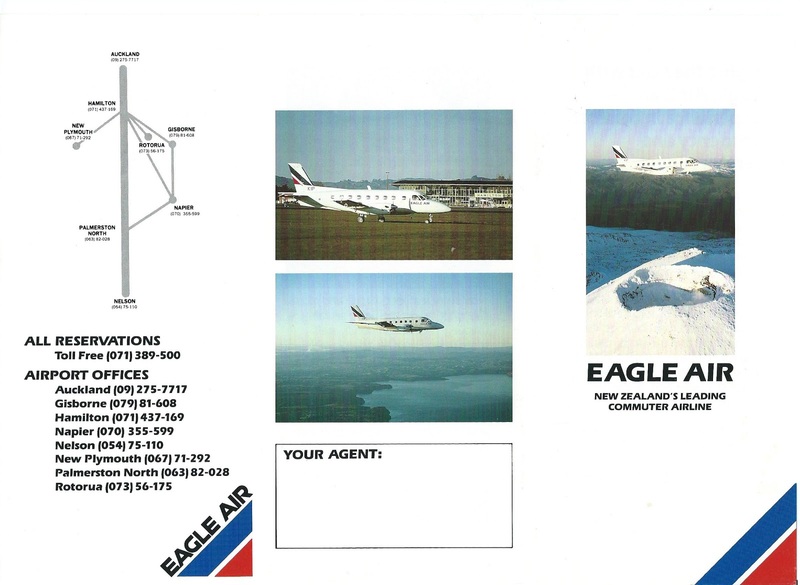 The revised timetable, effective from the 1st of August 1988, enabled Eagle Air to sell its remaining Piper Chieftain ending Eagle’s operation of piston-engine aircraft. 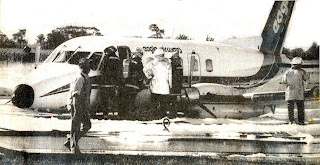 The Hamilton-New Plymouth service, meanwhile, was operated by a daily Bandeirante flight. At the same time Eagle inaugurated its second challenge to Air New Zealand when it introduced a direct Gisborne-Auckland Bandeirante service. 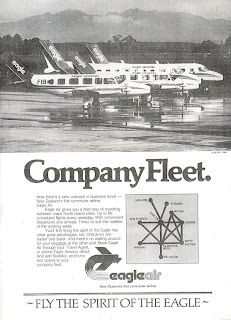 On the 12th of September 1988 the National Business Review carried an article saying the Eagle was looking at buying new aircraft to match the marketplace. The same article carried a statement from Eagle’s general manager, Don Good, who denied the rumour that there was a deal being struck with Air New Zealand or that Eagle was about to take over many of the national carrier's unprofitable routes. Four days later the rumour was to be proved true and Eagle was set to become a major player in the New Zealand domestic aviation scene. In addition to these it also operated Bell Air’s Piper Aztec ZK-DUB for a couple of weeks.